Adam Levine Furious Gwen Stefani Using Blake Shelton to Win ‘The Voice’ For Team Gwen? Does Adam Levine think that Gwen Stefani is using Blake Shelton in order to score a win on “The Voice?” Is Blake giving Adam a hard time over the Maroon 5 frontman’s critiques of Gwen’s contestants? There were a few tense moments between Blake and Adam during “The Voice” on Monday, November 9. Shelton made no secret that it was Team Gwen he was rooting for and not Team Adam. During the live show Blake was joking around and said, “Team Gwen overall is whipping he crap out of Team Adam tonight. I’m just calling it like it is.” But Levine didn’t seem to think it was funny. Does he think that Gwen is using Blake in order to get a Team Gwen win on “The Voice”? Entertainment Tonight reported that after the cameras stopped rolling Levine leapt out of his chair and was shaking his head and pointing at Shelton and Stefani – or “Shelfani” – then mouthed something at the couple. Allegedly this was all in jest and the three judges of “The Voice” had a good laugh over the incident. But some sources revealed that Adam didn’t seem to be having all that much fun with Blake and Gwen on Monday night. Later in the evening Blake reportedly appeared very upset with Adam following his critique of Team Gwen’s contestant Braiden Sunshine. Shelton went right up to Levine’s chair and onlookers report that the country music superstar was giving Adam a hard time. Gwen Stefani and Blake Shelton left the stage together after the end of the two-hour live show. 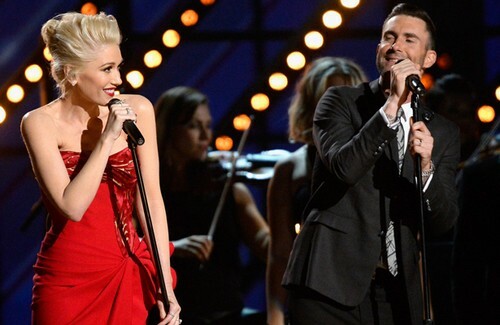 Though the couple didn’t hold hands or engage in any PDA, Adam Levine was noticeably shut out by the co-coaches. Monday’s “The Voice” marked the first since Shelton and Stefani appeared on the NBC reality show since officially confirming they are a couple. Does Adam Levine have reason to worry that Gwen Stefani is using her relationship with Blake Shelton in order to grab a win for Team Gwen? After all, a feud has been brewing between on-again-off-again “The Voice” coach Christina Aguilera and Stefani for some time now. Gwen is absolutely OVER Christina’s diva attitude. If push comes to shove Blake is probably going to pick gall pall Gwen and Christina Aguilera will be out of a job. What do you think? Team Blake has racked up four wins out of the seven seasons of “The Voice.” Team Adam has scored two wins. It’s starting to look as if Team Gwen is going to get the win for season eight of “The Voice” and that the “Use to Love You” singer is using “The Cowboy” to get that win. Christina Aguilera Replacing Gwen Stefani on The Voice Season 10 – Fired Over Blake Shelton Affair? Christina Aguilera Kicks Gwen Stefani Out Of The Voice Judge’s Seat – Gwen Dates Blake Shelton To Prevent Firing? Gwen Stefani Dating Blake Shelton Saves The Voice Job – Christina Aguilera Out Again? Gwen Stefani Suspected Gavin Rossdale Slept with Nanny – Justified Blake Shelton Cheating Affair?